Pets are creatures of habit, and sometimes pets can be very unpredictable toward new devices or equipment. That is why getting your pet a water fountain that he or she will internalize and enjoy can be a daunting task but you don’t have to worry about that because you have come to the right place. 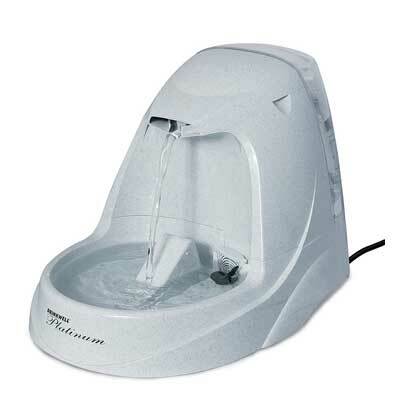 This review has compiled the best water fountains on the market to help you choose the most suitable fountain for your pet. With a 168-ounce water capacity, the PetSafe Platinum is ideal for all pets regardless their size. 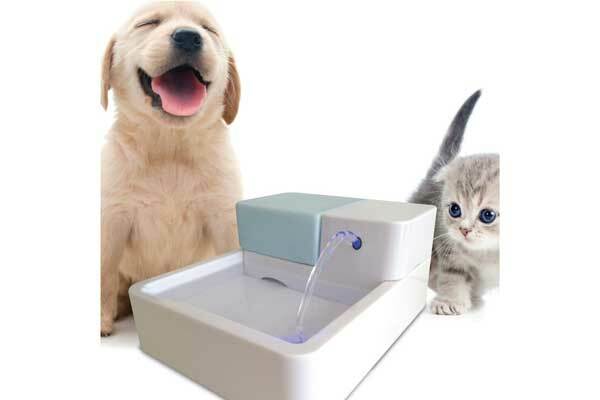 This water fountain comes with a free-falling stream of water meant to entice pets to consume more water. The water is passed through carbon filters fitted within the fountain to get rid of all odor as well as bad taste from water. 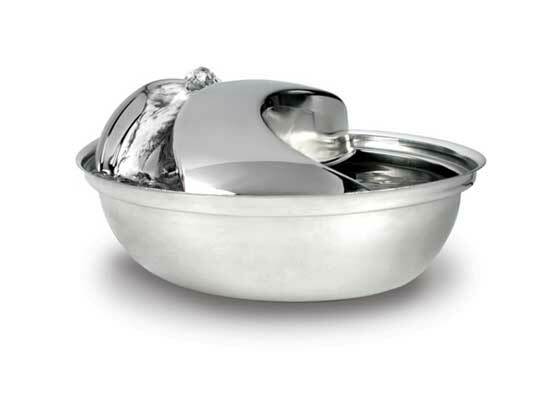 The Pioneer Pet is a 60–ounce pet drinking fountain made entirely from stainless steel. The stainless steel build is rust resistant and also makes it easier to clean. As for the operation, the water is passed through a charcoal filter to purify it then is dispensed to the drinking bowl where it circulates to appear as if it is a natural water fountain. 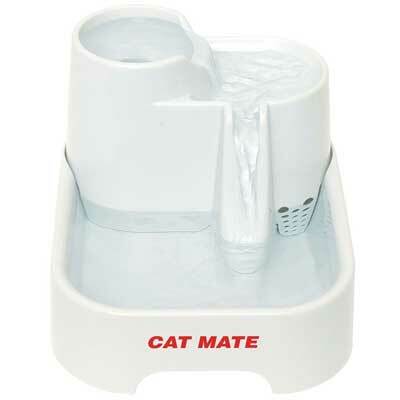 As for the design, the Ani Mate pet fountain looks like a multi-level water park with slides and water pools. 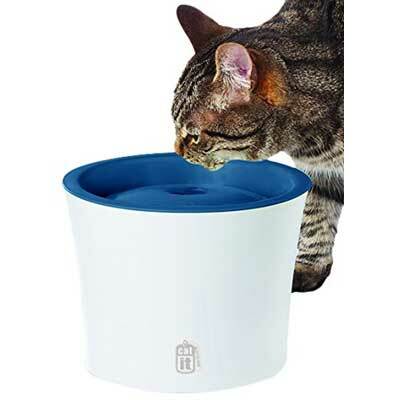 The Cat Mate features three different levels of drinking stations that are interconnected with ramps that drain water seamlessly without accidental splashes. Once the water reaches the bottom drinking station, it is pumped back up to the highest level thanks to the super-quiet Isolated Pump System (IPS) fitted in the fountain. 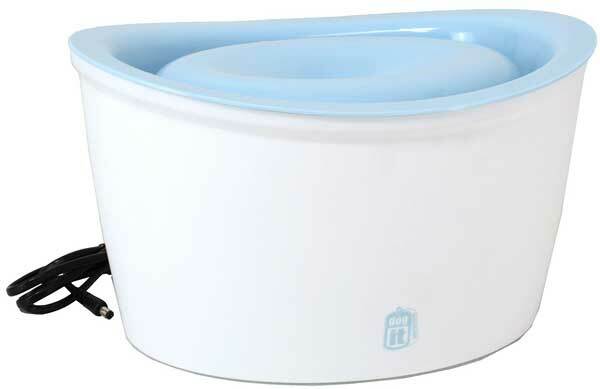 There is not much to say about this Easy-Clean water bowl since it has one of the most basic operations. 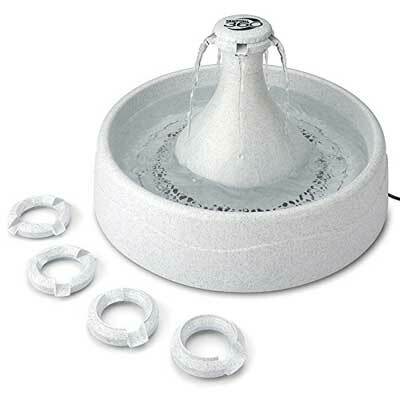 Design wise; the polyethylene-made pet fountain is shaped like a bowl with an extended opening that acts as a connection hub for its 5-foot long stainless steel hub. In terms of features, the Easy-Clean comes fitted with an auto refill system (a float valve) that senses when the water level is dropping to auto refill. 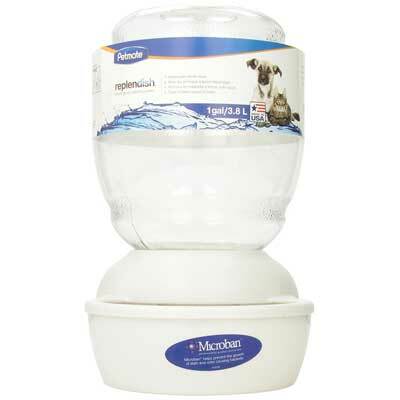 This auto-refill feature is a very convenient feature for large pets or super active pets that need constant hydration. The standout feature of the Uniclife is the LED lighting that is projected together with the dispensing stream of water. This neat feature coupled with the continuous flow of water attracts the pet to consume more water to stay healthy. The jet of water is pumped by a low-powered 12V pump that forces water through carbon filters for purification. With a maximum capacity of 1.8-liters, the Uniclife is suitable for all pets, especially the large ones. Design wise; the Dogit has a bowl-like design with a wide surface area. The purpose of the wide surface area is to maximize aeration in the water as well as to provide the maximum space for dogs or cats to drink water. 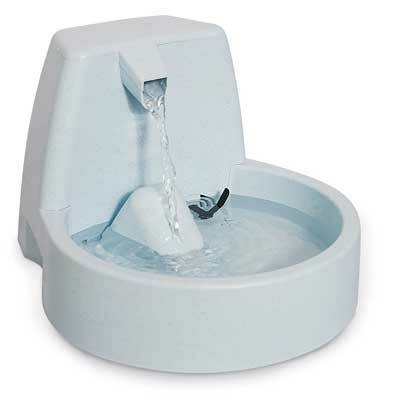 This drinking fountain is made of high-density polyethylene and finished in a light blue color at the top and a white color at the bottom to entice the pets to drink water. Other features include a multistage filtration system made of carbon to purify water. 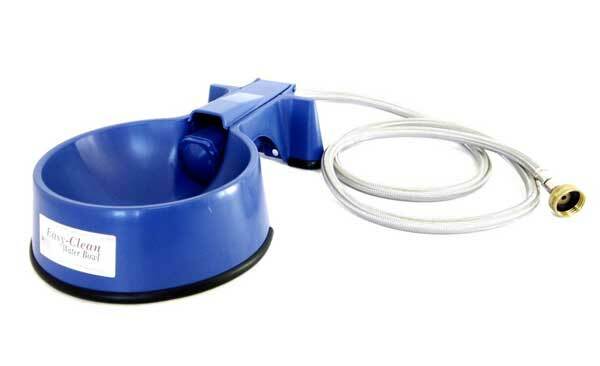 Petmate is a water fountain that uses gravity to dispense water off its 1-gallon capacity tank. Once the water leaves the tank, it passes through an advanced filtration system made of charcoal to purify the water. The purified water, in turn, dispenses to the drinking bowl which is fitted with micro ban antimicrobial protection to keep the water clean and fit for drinking. The PetSafe Original is a smaller version of the PetSafe Platinum with a considerably less water capacity of just 50-ounces. Despite being a smaller in size, the PetSafe Original is fitted with a large open area for water and a free-falling stream of water to make it easy for all pets to drink the water. This water fountain also comes fitted with carbon water filters for purifying the water and an adjustable knob that lets you control the flow of water. If only pets could choose what they wanted for their birthdays, it would be the PetSafe 360 fountain. This water fountain resembles an actual fountain with jets of water shooting from the top and collecting in the bowl at the base. This 128-ounce water dispenser comes with a replaceable carbon water filters for long term use. What’s more, you can adjust the flow of water thanks to the adjustable flow control knob fitted in the fountain. This 3-liter Catit widely resembles the Dogit in number 4 above except while the Dogit is primarily designed for dogs but can still accommodate cats, the Catit is designed primarily for cats but can still be used for dogs. For water purification, it has an advanced water filtration system coupled with a large open top surface to allow maximum oxygenation. The most impressive quality about this Catit is that it uses only 4 watts of power which is considerably less than a night light. This comprehensive review was compiled by a team of unbiased experts who put in the work of selecting the best water fountains from every section of the segment. So whether the main factor for you is design, price, functionality, efficiency, technological advancement, or even a combination of all, this review has a little bit of everything for everyone. All the best in your shopping.